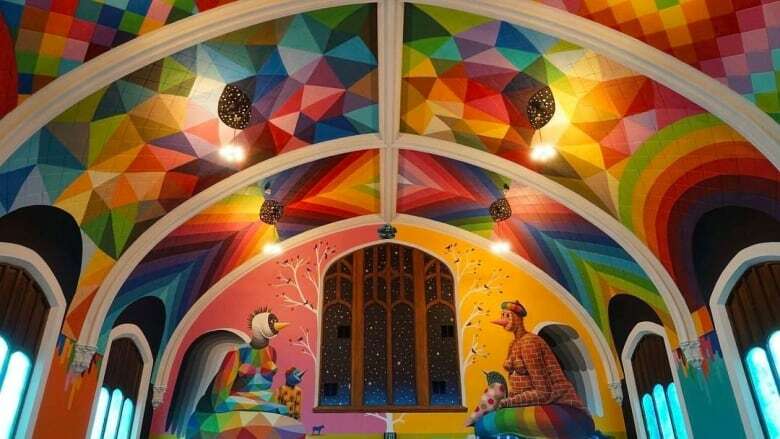 If two Edmonton art lovers get their way, a homely brick facade near Whyte Avenue will become a blank canvas for renowned Spanish street artist Okuda San Miguel. Michael Maxxis and Fish Griwkowsky have launched a $40,000 crowdfunding campaign for a six-storey mural in Old Strathcona. If the project is successful, a currently neglected corner of the Crawford Block annex on Whyte Avenue and Gateway Boulevard would become the face of the neighbourhood, Maxxis said. At 1,400 sq. feet, it would be the biggest mural in the city. "Big pieces of art like this inspire people," Maxxis said in an interview with CBC Radio's Edmonton AM. "I think it will have a big impact." San Miguel is known for his colourful and geometric large-scale designs. His work already adorns high rises, city streets and urban galleries across the world. "He's known for this bright beautiful art," said Griwkowsky, a local photographer, filmmaker and journalist. "He has giant murals all over the world: Moscow, Paris, there's one going up in Toronto. "He does animal figures, human figures and it's just gorgeous." 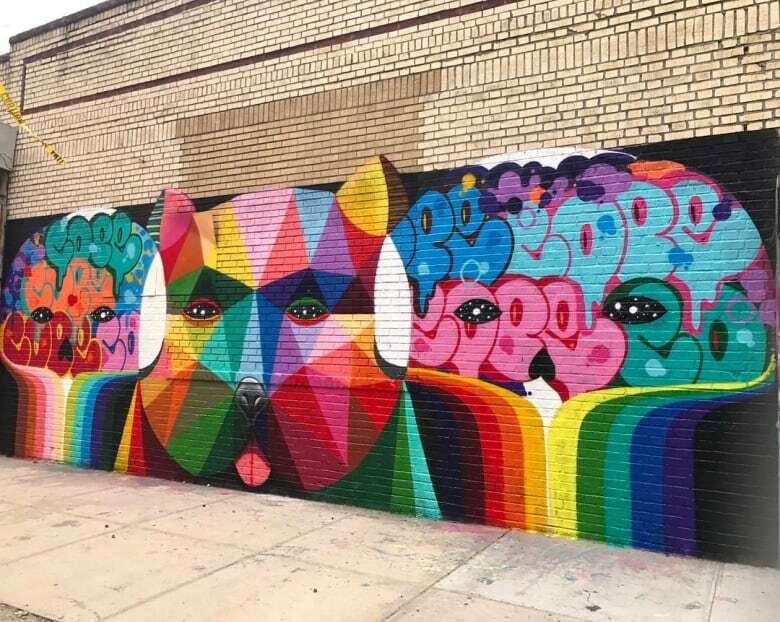 After being approached by the building's landlord about the possibility of promotional mural featuring business logos, Maxxis figured street art would be a better way to liven up the block. Maxxis — the owner of El Cortez, Have Mercy and Holy Roller — reached out to San Miguel through a mutual friend in California. After months of correspondence, San Miguel agreed to take on the project. He has already begun sketching out a concept for the space, one that was inspired by local wildlife. "It was actually quite the process," Maxxis said. "It's taken about six months. You can't get him to paint a mural just anywhere. He has to be inspired by the content, the location, the history, whatever it might be. "He said he was inspired and he wanted to do it." The project is expected to cost $84,000. Maxxis has been able to cover about half of that with help from the building's landlord, his own restaurants, and a grant from the city's Capital City Clean Up program. It's up to Edmontonians to cover the rest, he said. If they reach their goal, San Miguel could be bringing his trademark rainbow palette to the city soon. Either way, Griwkowsky believes the fresh paint job will be something even the city's most reluctant art lovers will enjoy, he said. "No one is twisting your arm but if want to throw in, you can be part of beautifying Edmonton," Griwkowsky said. "But if you're not willing to do it, you're welcome to look at it for free."